As we prepare to turn the page on the Kelsey Barlow Era at Purdue, we thought it would be worth looking back at the life and times in Old Gold and Black of a career that might be considered one of the more volatile at Purdue. Kelsey came out of B-dowd's high school, so we watched him before he even arrived in God's Country. In the wake of watching players like Keaton Grant and Chris Kramer, it was hard to believe Barlow fit the mold that Painter had created for his system and the guards that would play in it. As a high school Senior, he didn't move a lot without the ball on the offensive side...and didn't play too much defense. That was a hard pill to swallow -- we wondered if Barlow's attitude and selflessness would develop and in turn, his defense would come closer to resembling Purdue-style defense. As it turned out, we were right about his work ethic...but his athleticism coupled with a bit of nastiness was such a good combination, it could gloss over some of the other parts of his game that weren't up to par. His impact was immediate as a freshman. He was the primary sixth man for that Sweet 16 team in '09-'10 and made the all-freshman team in the Big Ten. Kelsey's presence was noticed right away, obviously, but it was the breadth of his impact that had us all excited. Barlow could score, create his own shot, rebound and dish the ball. He had a mean streak and we loved that about him, especially since we knew (or thought we knew) that Coach Painter and the upperclassmen would keep him in line, in terms of acting out a bit too much overall. Kelsey's season-high in points during that season came in a road victory over Illinois, where he also had his first career start. The sky seemed to be the limit for a guy who, we kept reminding ourselves, was just a freshman. In early February of that season, the Boilers traveled to their rival in Bloomington, where they hadn't won in about four years. Kelsey also started that game (over Lewis Jackson) and in 18 minutes scored 5 points to go with 4 boards, 3 assists and a steal. 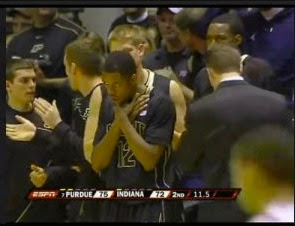 But he'll be forever remembered for his infamous choke signal as the clock wound down and the Hoosiers were unable to take down the Boilers. IU fans hated Barlow...that might have been one of his most redeeming qualities. Never mind that the choke accusation didn't really make sense. Maybe the Hoosiers or their fans were talking a lot (imagine that), but the gesture created a firestorm of criticism (not from us, but from the fans of the program who elevated the always-respectful Bob Knight to godlike status) and Kelsey apologized. We kind of loved that he disliked IU enough to do this and again figured that he would be kept under control for the most part and that if this was the extent of his acting out, we would be fine with it. Later that month, Rob Hummel injured his knee for the first time and a pall was cast over a season that saw the Boilers ranked in the single digits and having a shot at the #1 ranking in the nation. They climbed as high as #3 before falling back to Earth with a listless finish in the wake of Rob's injury, and hobbled into the NCAA tournament as a #4 seed (about two weeks after being ranked #3 in the nation and mere days after being bludgeoned in the Big Ten Tourney by a bad Minnesota team). The Boilers regrouped, though, and gutted out wins over Siena and Texas A&M, setting up a showdown in the Sweet 16 with everyone's favorite enemy, Duke. In that game, Kelsey Barlow made a play on a Kyle Singler breakaway that had bdowd and I punching each other in the arm. Singler attempted a layup and Barlow came from seemingly nowhere, using his underrated closing speed, and pinned Singler's layup against the backboard. The Boilers would not triumph on that night, but Kelsey's drive and determination -- along with us getting to chat with his dad at halftime -- continued to make us think bright times were ahead for this talented young man. That game in Houston in March of 2010 would sadly be Kelsey's last NCAA tournament game. 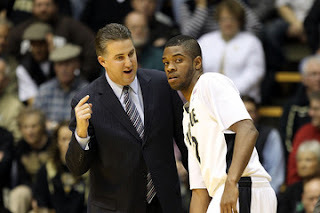 Kelsey continued to be Purdue's sixth man throughout his sophomore season of '10-'11, showing on-and-off flashes of brilliance and keeping us excited for the potential he had if he could only develop some consistency. Clearly, there were also on-and-off issues with Kelsey's attitude and focus, as some games he would play very little as Coach Painter attempted to screw his head on straight. He was rarely a high scorer and was not a viable outside shooting threat, but again, Kelsey did things that not many others could do. He ran the point effectively, he was hard to guard, he played the kind of exasperating defense Purdue teams are known for, and he had that mean streak. Barlow would enter a game with that mean-mug on and you just knew something was going to happen -- or he was going to try to MAKE it happen. One came, for example, as Purdue hosted Michigan State on the day GameDay was in town last January. Another, famously, came just recently as KB "posterized" Jared Sullinger. Kelsey would decide to wake the team and the crowd up and he would often succeed in doing so. Other times, the selfish-looking (and remember, appearances don't mean it's fact) Barlow would return and have his minutes reduced. One moment that stands out for us here at BS is the JJ game winner against Penn State at home. We all remember the shot and how clutch JJ had become. I remember looking at the outstanding photograph of the game-winner by Dave Wegiel and noting first how up-and-ready Rob Hummel was....and then b-dowd pointed out another face on the bench; Barlow looking positively pissed off at life. Does that mean anything? Or was it just a moment captured by a photographer that is out of context and means nothing? We'll never really know. The second consecutive NCAA tournament without Rob Hummel approached and the Boilers, while not 100% of the team we had hoped they'd be in 2011, looked pretty good, retaining a top ten ranking into the Big Ten Tournament. 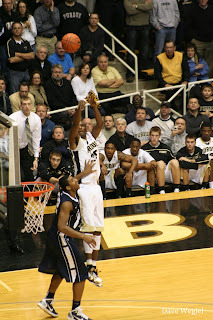 A whipping by MSU in Indy changed that as the Boilers rolled over in their first BTT game for the second straight year. Kelsey had but one point in that MSU game and generally did not look good, which was perhaps a harbinger of things to come. Just a few days before the start of the NCAA tourney, Kelsey Barlow was mysteriously suspended for the duration of the season for conduct detrimental to the team. Rumors abounded, but the only thing sure-fire was that Kelsey had screwed up enough to be disallowed by the Purdue coaching staff from participating in the tournament. Could Kelsey have helped stem the rising tide of the VCU cinderella story? Once again, we'll never know. I would have liked to see him try, though. We assumed Kelsey was now done with the Purdue basketball program, as we couldn't see Coach Painter allowing him to continue to be a headache and, let's be honest, to be unreliable. Whatever he did to get suspended from the team in March 2011 signaled that Kelsey Barlow wasn't putting the team first at the most critical time of the season. That seemed like a cardinal sin for this program. And yet there he was, back on the squad for the '11-'12 season, with the nebulous explanation that he was "on thin ice." What did that mean? Zero tolerance? Unfortunately, we recently found out. Both Kelsey and his father have spoken about the incident and it all appears to be something no more complicated than a guy in the wrong place at the wrong time who wasn't able to keep his cool. This team is tight and we like that, as we saw Ryne Smith step into a near-altercation during a game to back up Kelsey and in this came, it appears that DJ Byrd effectively took the fall for Barlow, with Rob Hummel acting as on-the-spot attorney. So now Barlow is officially off the team and will presumably be lacing them up at another program in the future. That's too bad, really, as he comes from a good family and has simply made some bad judgment calls. However, fair or not, the decisions we make in certain key points in our lives are how we are judged. How might things have been different throughout Kelsey Barlow's time at Purdue had he just made the right decisions at some of these key times? It doesn't really matter now, but the refrain is nonetheless the same again: we'll never know.